Trusted by Hundreds of Thousands of Professionals! Why Choose CPR Near Me? Save Time and Costs with Our Affordable Training! Stay focused on providing CPR certification training as we drive high quality customers to your local business. Let us maximize your clientele. Over 120 million people in the U.S. need life-saving CPR certification training per year. Connect with our customers online while boosting your online and local presence while driving up sales. See how CPR Near Me can work for you and test our database. 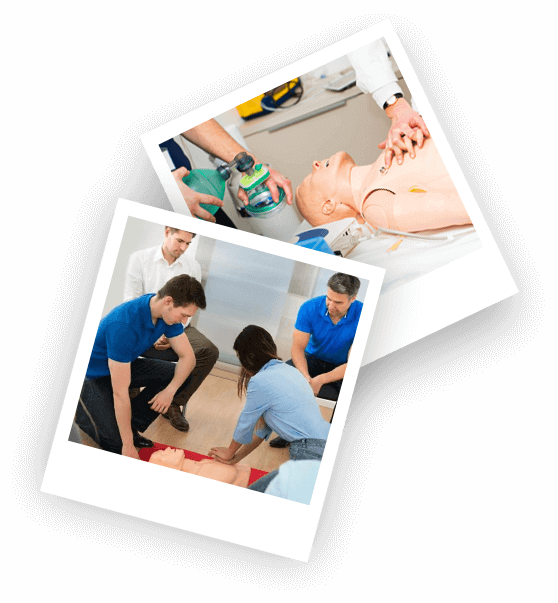 CPR certification training should be done with ease – sign up, sit back, and let us drive customers to your business. Courses: CPR, First-Aid, Automated External Defibrillator, Bloodborne Pathogens (BBP), Basic Life Support (BLS), Advanced Cardiac Life Support (ACLS), Pediatric Advanced Life Support (PALS), Wilderness First-Aid, Babysitting and Childcare, Electrocardiogram (ECG), Emergency Oxygen, Lifeguard, Pet First Aid, and Pharmacology. Finding CPR certification training online has never been easier! With my busy schedule I couldn't be happier. Thank you so much! Thank you CPR Near Me for helping me find the closest Online CPR certification training provider! It couldn't have been more hassle free! Ratings, well worth it! The CPR Near me site is very convenient for finding CPR certification training locations near me. It's quick and precise. There is no other way I'll search for certification again. Thank you. CPR Near Me is dedicated to helping those in need of training find local CPR certification training providers online and classes everywhere throughout the U.S. – whether it be through large providers such as American Heart Association CPR or Red Cross CPR or through smaller CPR certification providers local or online. 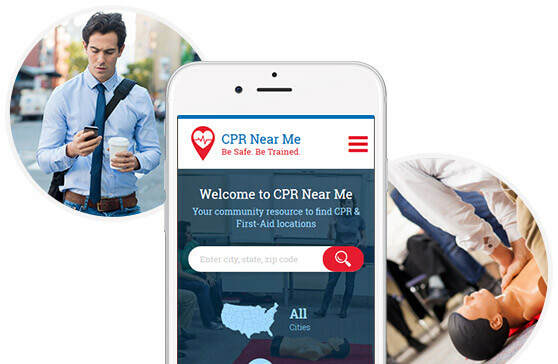 CPR Near Me has been developed to use the power of location technology for local and listings services to provide the best and most accurate profiles for life saving CPR certification training providers. What Does CPR Near Me Offer? Did you know that CPR training is surprisingly easy to do, even if you’re not a professional in the medical field? Do you need online CPR certification? If you’re on the lookout for CPR classes, you now have a number of tools at your disposal to find and complete both training and certification. Use your smartphone, tablet, or computer for example and connect to an internet network at home or at a local café with free Wi-Fi to search for credible online CPR certification classes – think CPR Near Me. Next, peruse CPRNM’s directory of public health and safety courses, which teach you how to respond to medical emergencies outside a hospital setting. If you’re a provider sign up now, submit your listing, and provide services. The beauty about tapping into our online directory is that you need not set foot outside your doors to learn CPR or how it’s done. Simply grab a device to access online training materials put together by field certified professionals. Many of us can agree that Google has become an indispensable tool that saves us time and energy. If you want to find listings of local service providers, for example, you only need to type in the service type required in the search bar. Today, advanced technologies like Alexa allow you to complete audio searches and get answers in real time. However, when it comes to weeding out information on quality service providers, including CPR classes, it’s best to turn to authoritative sources such as CPR Near Me. It’s a comprehensive resource of well-screened service providers. What separates us from the pack is that we only recommend providers who teach AHA authorized guidelines for first aid and CPR classes and others. To access a verified list of local CPR providers, use the search bar where the results can be filtered by state, city, zip code, and more. When you click on any of the courses available on the CPRNM directory, you get complete access to training materials that teach you how to perform techniques that could potentially save a life one day. The platform wholly believes that everyone should know how to complete the basics of CPR and first aid training, even if your job does not stipulate these requirements. Every year, thousands of people are hospitalized for medical emergencies that happen at home or while traveling. Think heart attacks, drownings, or strokes, for example. Individuals who are professionally trained in CPR know how to identify these conditions and moreover understand the techniques required to keep the heart beating until advanced medical help arrives. In other words, this type of training literally saves lives and prevents further damage by keeping the blood – and brain – oxygenated. First aid training moreover prepares you for more common injuries, such as burns, fractures, wounds, and more. If you’re a parent, professional, or retiree who wants to improve your knowledge and abilities for treating injuries, a convenient way to accomplish this is to read the free training materials on the CPRNM directory. Both online CPR training and local CPR classes present their own set of advantages. For example, in-person training allows you to see hands-on demonstrations of techniques. If you’re a visual learner who thrives in such learning environments, then a local CPR class may be ideal. However, when you consider the explosion of video technologies, many people question if they’re missing out on anything if they opt to study educational materials exclusively online. The incorporation of video technologies along with comprehensive training materials that can be accessed anytime and anywhere has fueled the growth on online learning centers such as CPRNM. When undertaking any new goal or project, it’s easy to get overwhelmed. CPRNM, however, takes the pressure out of getting trained and certified in CPR, first aid, and other courses. There are no time constraints for completing any one course on the website. You can start, stop, and resume studies as you choose – without penalties. Unlike the laundry list of assignments and chores we have in life, there’s no need to watch the clock at CPRNM. As with life, we believe everything, including learning, should be taken in strides. We know modern day life is demanding with family, work, and other obligations. As such, we aim to make it easier for users to study in their free time. Investing in online education is exciting and challenging at the same time. In most cases, the pressure to pass the final test is enough to induce debilitating stress and anxiety. However, at CPRNM, not only do we keep our prices low, these fees are not required from the get-go. Payment is only required when you need proof of certification, which is available following a passing grade. Moreover, the test can be retaken as many times as you need to – without penalties or extra surcharges applied. Ultimately, CPRNM is a worry-free and foolproof way to get certified in emergency life saving techniques, such as CPR, first aid, and more. The latter option can be easily completed on CPRNM during a lunch break, when you get home, or on the weekend, for example. Read the materials or skip to the final test if you are confident in your current abilities. Upon completing the test, printout instant proof of the certification. You will also receive a CPR certification card in the mail within 2-5 days. This accreditation will be valid for 24 months. After this period expires, you can get recertified on the platform using the same processes. The CPRNM directory advertises “free training” in CPR, first aid, and other courses for all. What’s the catch, you may ask? Put CPRNM to the test by browsing the online directory for courses that intrigue you. Next, read the course materials from start to finish without restrictions. Doing so is completely free – with no catch whatsoever. If you take the test, pass the exam, and want proof of certification, this is the only time that payment is required. In other words, the training is 100% free, while the certification requires a small investment on your part – less than $25. Additionally, certifications are only available after a passing grade, however, you can retake the exams as many times as needed without penalties or extra surcharges if you fail. 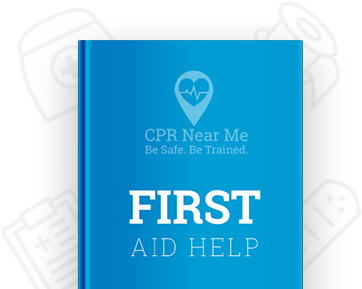 If you’re a medical professional or worker whose job requirements demand current proof of first aid or CPR training, the CPRNM directory provides a cost-friendly and equally credible alternative to the American Heart Association CPR classes. All training materials on our platform are put together by hands-on and fully trained professionals who adhere to OSHA and AHA guidelines. CPR – Learn to recognize when CPR is needed and the protocols of performing chest compressions to revive or maintain a patient’s heartbeat. Infant CPR – Discover the main differences of completing CPR on adults vs. infants. Similar to Red Cross CPR classes, this online course shows you AHA approved methodologies for giving chest compressions to infants under the age of 12 months old. First-Aid – Gain the confidence to treat a wide variety of injuries using first aid techniques. Bloodborne Pathogens (BBP) – Reduce the risk of transmissions of bloodborne pathogens while administering first aid and other types of medical interventions. Pediatric Advanced Life Support (PALS) – Geared toward medical professionals, get a crash course that fully prepares you to roll up your sleeves and keep pediatric patients’ hearts beating – when the time comes. Advanced Cardiac Life Support (ACLS) – For medical professionals, also, discover the differences for setting up ACLS between pediatric and adult patients. The history of CPR and first aid dates back to the 1700s when Europeans developed standard techniques for providing mouth-to-mouth resuscitations to drowning victims. From there on out, having learned the priceless benefits of possessing this knowledge, the Society for the Recovery of Drowned Persons was established. Later in the 1800s, a doctor discovered the value of performing chest compressions. Over the years, many tweaks have been made to these first discoveries of CPR. In fact, we have very standardized methods of care that are recommended by the American Heart Association (AHA) and the Occupational Safety and Health Administration’s (OSHA), all of which you can learn on CPRNM. 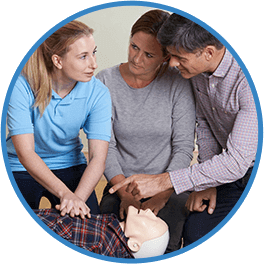 If you like the idea of online training but prefer local CPR classes, including American Heart Association CPR training centers, CPRNM provides the option of finding in-town providers that you can meet face to face. The providers are narrowed down by state, where you can zoom in to find a provider that is close to you. In addition to online and local CPR class listings, CPRNM aims to be a comprehensive resource for getting support long after the studies have been complete. The company’s culture is centered on improving public health and safety by providing easy access to knowledge and materials that could one day help our loved ones, as well as our neighbors and friends. CPR Near Me provides online CPR training for anyone who is interested in learning emergency saving techniques, including CPR, First-Aid, Bloodborne Pathogens, and Basic Life Support (BLS) for example. Best of all, these are free CPR classes. You are free to review and study the materials, and even take the test without paying anything. If you want proof of certification, this is the only time you will be required to pay – following a passing grade, that is. Take a look around and discover directories of provider listings, resources for training, and much more.